I’ve been hiking in the fells for the past 40 years, and it’s nice when I have a day when I see something new. I decided to grab a couple friends and hike the skyline trail. The day was perfect, sunny and in the 80’s. The area was crowded so I knew the wildlife viewing would be limited. 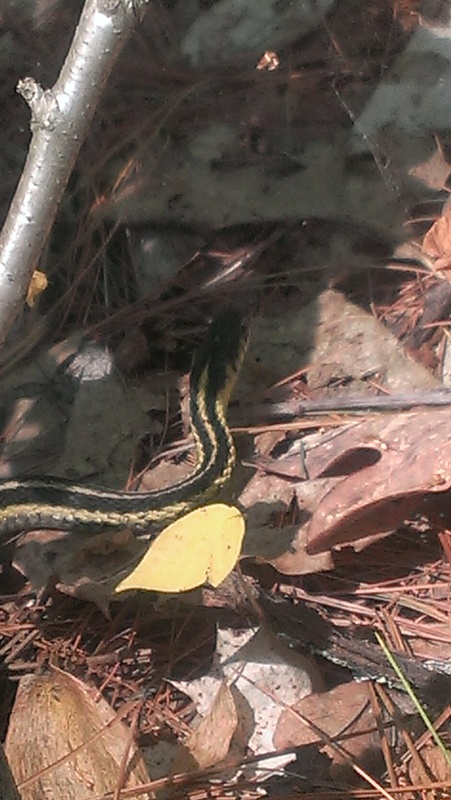 As we hiked, we came across a few garter snakes. 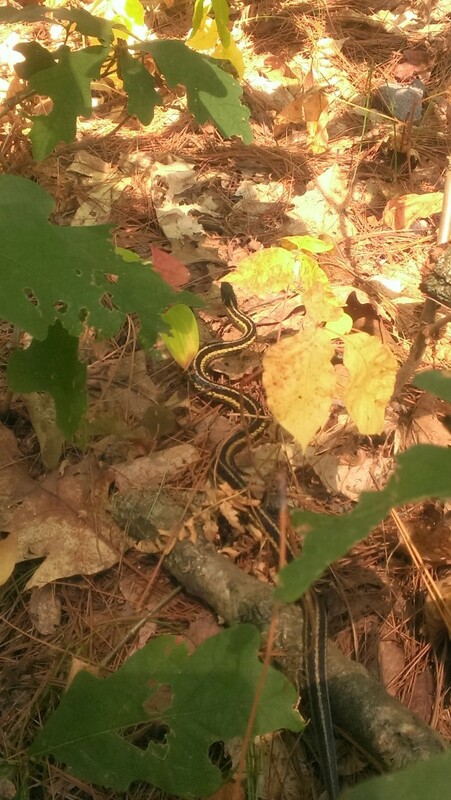 About a mile up the trail we came across a baby snake crossing the trail. 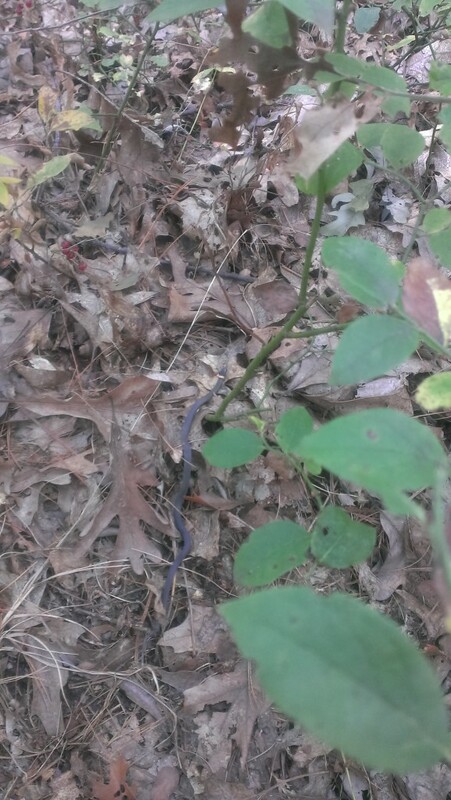 It was dark brown and had a small spot on it’s neck, I had never seen this before. I was excited to learn it was a juvenile northern brown snake. Look closely and you can see the light band around the neck. The picture quality isn’t great. 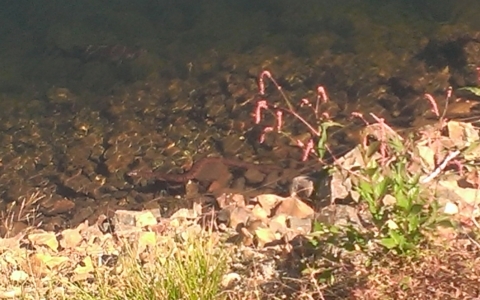 Our last snake sighting of the day was a water snake that was being harrassed by a bass. 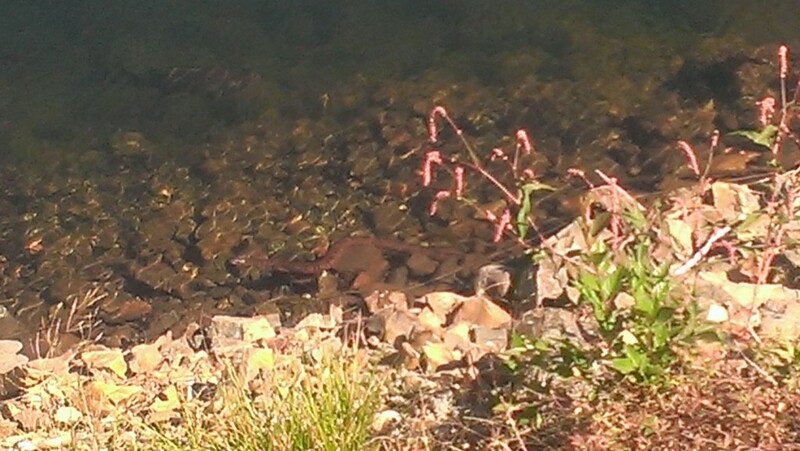 Look closely and you can see the snake in the water along the shore and the bass in the water. 2 white tailed deer does have been seen near the crystal spring trail, just off greenwood park. A pair of great horned owls have been seen just behind Stone Zoo. A single pileated woodpecker was seen on the cross fells trail, very close to the flynn rink lot. A pair of pileated woodpeckers was aslo reported in the virginia woods area. A pair of kestrel have been seen hunting in the meadow at the upper reserviors off the rock circuit trail. Numerous reports of mink around spot pond. Off Whittemore brook rd 5 white tailed deer does and a woodcock were seen last week. I’m going to try and publish wildlife sightings more often, so please email me at pbeararl@yahoo.com if you having any sightings to report. Assistant Curator at the Stone Zoo Since 1997. 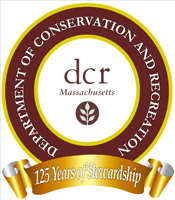 I have worked for Zoo New England for the past 27 years.I lead the animal habitat hike the second sunday of every month. Thanks Pete. What a treasure we have in the Fells; aided by great observers like you.